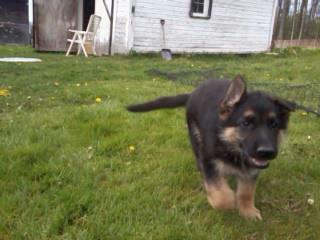 We got Samson when he was eight weeks old. He already weighed 21 Ibs, so we knew from the beginning he would be a big boy. Immediately he took to us, the only whining we heard were in the car after we picked him up. He didn't make a peep the first night, just curled up and fell asleep. He is extremely well behaved and is protective of all of us in the household. Right now he is just over five months old, and at the last vet weigh in - he was just over 4 months- he was 59 pounds. We were prepared for a big boy, but weren't expecting him to be as big as he already is. Welcome to the wide world of German Shepherd Dog ownership. 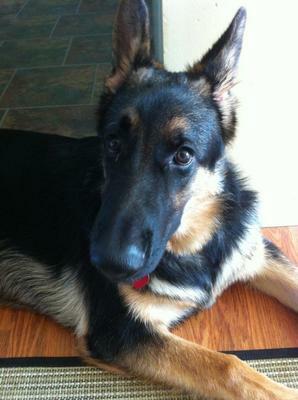 It is truly amazing how fast a GSD puppy can grow in it's first year. 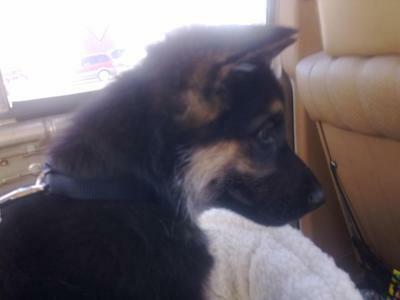 And for a male German Shepherd puppy, he'll still be growing until he's about 3 or so so be prepared. Male German Shepherd Dogs reach about their full height by 12 months or so however they will continue developing and will start putting on a more adult looking figure between the first and third year. And most importantly for many owners, they will continue to develop mentally into a calmer, adult dog. Congratulations on your new puppy Samson and what a Handsome little boy he is! You will loads of fun with him in his puppy and adulthood. I just love the puppy year teaching, training and bonding and holding against my chest, the licking on the face; I miss it. Enjoy every moment of this time; it's so precious. Samsom will grow big and strong and will be a Protector - German Shepherds are very protective you will see; especially if you encounter with a stranger. Take care of your boy Samson and he will take care of you!